Installing a multiroom stereo system can involve drilling holes in walls, running wires throughout the house and spending a lot of money. And after all that, the stereo still won’t have access to as much music as your computer. This week, I tested an alternative to the traditional stereo system that lets you control digitally delivered music in multiple rooms without spending a lot of money. I tested Sonos Inc.’s $399 ZonePlayer S5 (Sonos.com/S5), an all-in-one system that plays music off of your Windows PC or Mac, including music files on the computer, content from Internet radio sites Pandora and Last.fm, local radio stations, Sirius Internet radio, Napster and Rhapsody. The S5 plugs directly into your router and a wall outlet, and a simple software program installs on your computer, working as a desktop remote control. It can work in concert with other S5s or other Sonos products to create a multiroom system around your house. And a free iPhone or iPod Touch app facilitates full remote control of multiple systems. Since 2005, Sonos has offered high-end audio systems that permit people to listen to their digital music in multiple rooms on stereo systems with straightforward setups and simple remote controls. But its past products were relatively costly and required users to provide an existing stereo setup, powered speakers or a device (like a Bose Wave Radio) that allowed adding components via an auxiliary line-in. The ZonePlayer S5 is Sonos’s first product that works right out of the box and doesn’t require additional pieces. It took me very little time to set up and, once set up, sounded great. Music fans will want to know that it has five speakers powered by five dedicated digital amplifiers, two tweeters, two midrange drivers and a subwoofer. Discreet buttons on the top of the S5 can be pressed to mute, raise or lower volume. 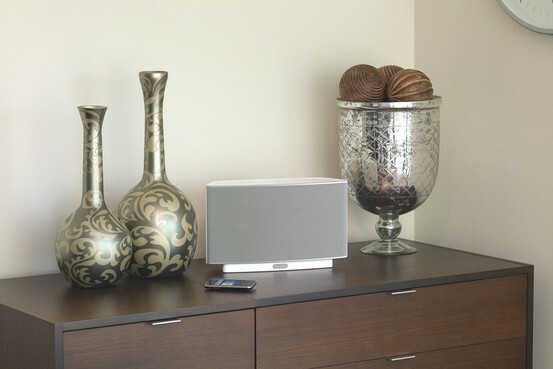 The Sonos ZonePlayer S5 can be part of a multiroom digital sound system controlled by a free iPhone app. Sonos’s $99 ZoneBridge accessory frees the ZonePlayer S5 from being wired to a router. Most people will need to buy one of these because they don’t have their routers set up in the same rooms where they want to keep their ZonePlayer S5s. The ZoneBridge is what it sounds like: It can bridge a connection between your home network and one or multiple ZonePlayer S5s—or other Sonos products. There’s no limit to the number of Sonos products that can work with one ZoneBridge. Last year, Sonos created a free app for Apple’s (AAPL) iPhone and iPod Touch that, as of a recent release last month, works just like the standalone $349 Sonos Controller 200, a touch-screen remote control. Using either the free app or the Sonos Controller, people can control music on multiple ZonePlayers and on other Sonos devices. For example, from my iPod Touch, I can mute one ZonePlayer and crank up the volume on another; I can skim through and play a list of Billboard Chart hits from Napster or listen to one of my personalized stations on Pandora. If you’re like me, you don’t like bothering with plugs as you move electronics around your house. Even though the ZonePlayer S5 has a built-in handle and can easily be moved around (it weighs only about nine pounds), it will need its AC adapter cord wherever it goes. And the ZonePlayer S5 doesn’t have a dedicated iPod dock. Sure, you could buy a cord to plug an iPod into the auxiliary port on the back of the ZonePlayer, but that’s not the same as a dock. Competitors, such as Bose Corp.’s $270 SoundDock Series II, work as speakers and iPod docks. The Bose can’t sync with other SoundDocks, as Sonos products are made to do, nor can it wirelessly play music from the hard drive of a nearby Windows PC or Mac. But as long as an iPod Touch or iPhone is loaded with free apps from Pandora or Last.fm, it can be placed in the SoundDock to play Internet radio through this system. And Bose’s $360 SoundDock Portable works plugged in or for over three hours on rechargeable batteries, making it easier to move around the house. It took me less than 10 minutes to set up two ZonePlayer S5s, one ZoneBridge and a Sonos Controller 200 remote control in three different rooms. The ZoneBridge is just 1½ inches tall and its surface measures about the area of a piece of toast. It plugs directly into a router so the S5s can work anywhere within the Wi-Fi network, though they still must each be plugged into a power outlet. I installed Sonos’s setup software, which came on a disc with the ZonePlayer S5, on a Dell (DELL) XPS One running Windows 7. When prompted, I followed on-screen instructions that explained how to press a button on each ZonePlayer S5, the ZoneBridge and the remote to wirelessly link them to my system. An indicator light on the S5 and ZoneBridge changed from blinking to solid to signify the connection. Free 30-day trials of Sirius Internet Radio, Napster and Rhapsody come with the ZonePlayer S5, and the software is smart enough to set everything up in one step so users can start listening without first filling out any forms (like email address, name etc.). If users don’t have accounts with Internet radio sites Pandora and Last.fm, they must go to those sites to create accounts online. I entered my Pandora Internet radio user name and password on the computer, and my saved radio stations appeared on the computer screen. These personalized stations also showed up on the Sonos Controller’s colorful touch screen, as well as in the Sonos Controller app on the iPhone. And Pandora’s thumbs-up and thumbs-down buttons also work on these portable remotes, so my musical preferences were saved in my account as I selected each to indicate whether or not I liked a song. I played all sorts of content from the Web directly on my ZonePlayer S5s: hip-hop from Jay-Z, Ella Fitzgerald jazz, classical Christmas songs sung by the York Minster Choir, my local NPR station and tracks from Shakira’s new “She Wolf” album. I also listened to music from my computer’s hard drive. The Sonos ZonePlayer S5 lets you build a stereo system that can be wirelessly spread around with help from the company’s $99 ZoneBridge. And, as is the case with all Sonos products, the setup process is fantastically simple. Now that the iPhone and iPod Touch can use a free remote-control app that works just as well as the Sonos Controller 200, these players are even more accessible.